Typically speaking rising damp is not observed more than 1.5 meters above ground level. Like other forms of damp it is often mis-diagnosed or confused with other damp forms a member of Homeshield's team will visit your property to analyse the obvious and not so obvious characteristics of your damp and advice on the best remedial action. 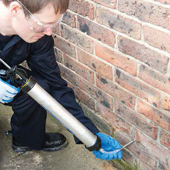 Rising damp generally occurs where there is no physical or chemical damp proof course, the damp proof course has broken down or it has been 'bridged'. This system is fast, clean and effective and can be used on brick or stone walls of any thickness.